Solange Luyon fled France: in 1680, she arrived to the City of Bath, to Lilliput Alley, where a baker's business bloomed, and she baked the bread of her Huguenot heritage. Her name was anglicized, and the popular breads known henceforth as Sally Lunn's Buns. The baker's house still stands and the breads are still made, though the oven is updated now. But what became of Sally Lunn, refugee, entrepreneur? When her recipe was rediscovered in a secret compartment above the fireplace, was there no clue of the writer? She disappears, in a puff of blown smoke. Marie Byng-Johnson is almost as vague. She bought a run down town house, in Bath, in 1937, and turned it out as a tea room. She found a secret compartment and there was a secret recipe and she told Sally's story and baked her buns and business was good. If you google Marie, you will find Sally, and some old water colours of scenes around Bath. That is as much as I know about Marie. Solilem, incidentally, is the name of a brioche type treat, an old recipe arguably from France or Alsace. Another story appears, unearthed on internet travels, in which a real woman of name unknown does bake the breads and her cry to buy is: Solilem! Solilem! 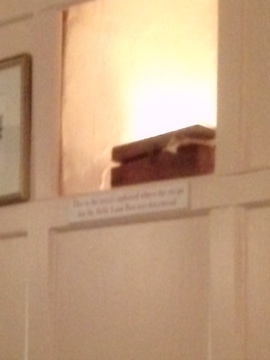 She is known as Sally Lunn: it is what she might be shouting. But what became of Marie? 'Victoria Art Gallery objects to be de-accessioned. The secret compartment is revealed/alleged! This was titillating. I love the way you structured the post. A joy to turn over every stone as I went along with your words.